Those muffled sounds below - that's a party still in full flow. Shame you got too anxious, went big too early, made a couple of inappropriate passes, started singing that song about chariots, before falling headlong through a pasting table. So here you are, dark and maudlin. Wanting to know what's going on at your own shindig but too fearful to rear your head. All that intricate planning. All that worrying that people might not show up. The strange mixture of relief and fretfulness when they did. And this is the legacy. This is England 2015. Bleak, isn't it? Well, just right now it is. Forget, for now, the financial implications of England's early World Cup exit. Forget where it leaves rugby union in the host country. For now the legacy is emotional rather than analytical. Sportspeople who represent their country carry a high voltage. When they fail it means lights dimming, electricity draining away. A return to the everyday and the mundane. To complete a grim picture, stick one of those party horns in your mouth and blow out every now and again. Oh, the melodrama. Those who remember the England football team's journey to the semi-finals of Euro '96 will know how exhilarating a successful run by a host nation can be. Like some euphoric drug, it has the quality to twist the mood, get strangers hugging in streets, declaring love to people they don't even like, mask life's tedious details. Oh, the memories. That this euphoria is blown from the fans back into the team as a tournament progresses ensures that early exits by hosts in major tournaments are a rarity. On three occasions hosts have won the Rugby World Cup, in seven previous editions. On five occasions they have reached the final. In 20 football World Cups, the hosts have reached the quarter-finals or better on 17 occasions. Two of the teams that didn't were the United States and South Africa, hardly footballing behemoths. The England rugby team don't have that excuse. 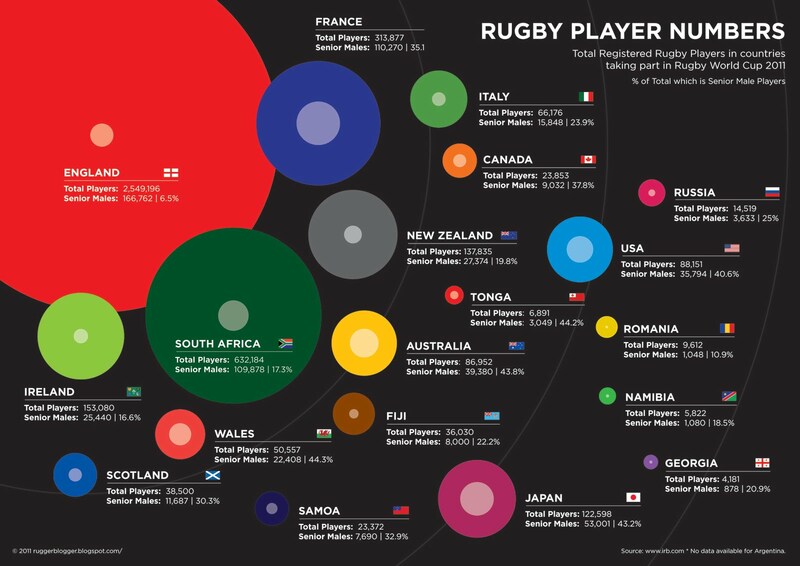 According to World Rugby statistics released during the 2011 World Cup, England had approximately 2.5m registered players. The five remaining countries that make up the Six Nations added to the four countries that play in the southern hemisphere Rugby Championship had 1.53m players between them. And England fans wonder why supporters of other countries find the Red Rose's premature wilting so funny. If I wasn't English, I'd probably still be laughing now. Especially when you had illustrious English pundits such as World Cup-winning coach Sir Clive Woodward questioning Australia's intelligence, a couple of days before the Wallabies comprehensively outwitted his old team. As it is, it just seems more absurd than funny, especially when you factor in England's bountiful finances: in 2012-13, the Rugby Football Union generated £153m in revenue, more than the unions of New Zealand (£54m), Australia (£55.7m) and South Africa (£42m) between them. Let's not forget, the performance of England at this year's World Cup was not a blip. Since winning the Webb Ellis Trophy in 2003, they have won one Six Nations title and no Grand Slams. During that time, France and Wales have won four Six Nations titles each and Ireland three. It doesn't take a genius to work out that England are not making the most of their superior resources. True, a daft seeding system made Stuart Lancaster's task far more onerous than it should have been, with his side thrown into a horrible pool with two fine teams in Wales and Australia. Also true, some of the thinking of Lancaster, his coaching team and the RFU ranged from the questionable to the indefensible. But for all Lancaster's talk of creating the correct culture within Team England, when failure continues to stalk a rugby nation as numerically and financially well off as England, you can only conclude that the culture is out of whack at a lower level, down at the roots. England got knocked out of their own World Cup in the group stages because of a lack of world-class players. In short, they just weren't good enough. Legacy is a slippery word, as London Olympics mastermind Lord Coe will testify. On one level legacy means converting people who turn up to watch and furiously wave flags into participants. This, the London Olympics failed to do, because enthusiasm evaporates if it is not combined with investment and infrastructure. In the case of rugby union in England, participation in itself, as we have seen, is not the problem. As such, whether fewer kids take up rugby than anticipated because of England's early World Cup exit is irrelevant. "Instead of hiding away, England fans should come down and rejoin the party." The RFU's target to introduce rugby union into 750 state secondary schools by the time of the World Cup in Japan in 2019 is laudable. But rugby union is a fiendishly complicated sport and many state secondary schools do not have the staff, the time or the resources to teach their kids how to play the game properly. A less eye-catching, but arguably more important, plank of the RFU's legacy plan was the drive to recruit and train 2015 new 'level 2' coaches, which hit its target in July. The linking of schools to local clubs means kids from schools with limited resources can benefit from more specialised coaching and those same coaches can be sent into schools to make their rugby cultures more robust. Consider this: since finishing bottom of their group at Euro 2000, Germany has built 52 centres of excellence and 366 regional coaching bases. In 2012, Germany had 35,000 coaches with Uefa A, B and pro licences, while England had fewer than 6,000. Two years later, Germany won their fourth World Cup in Brazil. England? Knocked out in the group stages. It all makes perfect sense: it's the coaching, stupid. As former All Blacks scrum-half and BBC pundit Justin Marshall pointed out after Australia's scintillating display against England, the Wallabies have quick-witted footballers throughout their team. "Prop Sekope Kepu can pass as well as scrum-half Will Genia," said Marshall. "And so can the locks and the back-rowers. But did we see any of that from England? Not at all." What English sport calls "flair", other countries call necessary skills, delivered under pressure. This still has the makings of a great World Cup. Some of the big beasts are creaking and the rest have begun to catch up. So instead of hiding away in your room, you should come down and rejoin the party. You might even learn something. Just don't sing that song about chariots. Read more on England's Rugby World Cup: Where did it all go wrong? 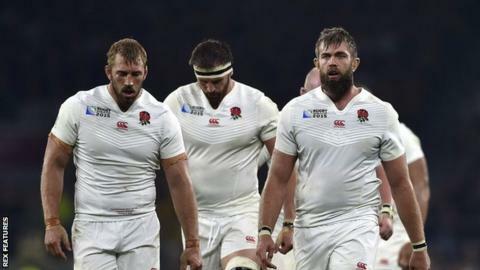 What next for England rugby? Read more on What next for England rugby?